Having a baby rocker for your little one can be a real lifesaver when you have to work on other things. With the number of baby rockers available to choose from, deciding which one you want to bring home for your baby can be a real challenge. There are plenty of reasons why these three top rated baby rockers are parent favorites. A baby rocker is a perfect place to put your baby while you are taking care of things that require the use of both your hands. Read below to learn about the features of each of these top rated choices and the benefits of getting a baby rocker for your little one. The reviews of these top rated baby rockers and the buyer’s guide following the reviews are designed to help make the process of choosing a baby rocker much simpler. The purpose of a baby rocker is to keep a fussy baby calm or help a restless baby get to sleep. They are designed to be set on the floor and then the baby can be entertained with the attached toys if there are some or vibrations which many baby rockers have. Some models of baby rockers have music that can play as well. It is a good option for keeping the baby entertained for short periods of time without taking up a lot of space. This Fisher-Price Baby Rocker is the perfect item to have for when you bring your baby home from the hospital. It has a weight capacity of up to 40 pounds and offers parents 3 seating positions that recline the baby back comfortably. The adjustable seat can be set according to the age and size of your baby or toddler. Turn it into a stationary chair with the convenient fold out kickstand. This baby rocker offers transitional use starting with the very first day you bring your baby home. As they get a little older, you can change it to an infant seat that has 2 toys overhead on the toy bar to play with and look at. If you’re trying to calm a fussy or tired baby, just turn on the soothing vibrations and let it work its magic to calm them down so they can go to sleep. Once the baby grows into a toddler, you can remove the toy bar and your toddler has a rocking chair for their room that is just their size. The seat cover is machine washable and dryer safe, so you don’t have to worry about having to put your baby in a dirty baby rocker. Other features of the Fisher-Price Baby Rocker include a three point restraint as well. It requires 1 D battery and folds up for easy travel and storage too. This little baby rocker will last through many stages of your baby’s development. It makes a fantastic baby shower gift as well. Lull your baby to sleep with this terrific baby rocker from Ingenuity. Their Moonlight Rocking Sleeper provides baby with a place to get rocked gently but also gives them a wonderful starry light show that can distract and entertain your little one. 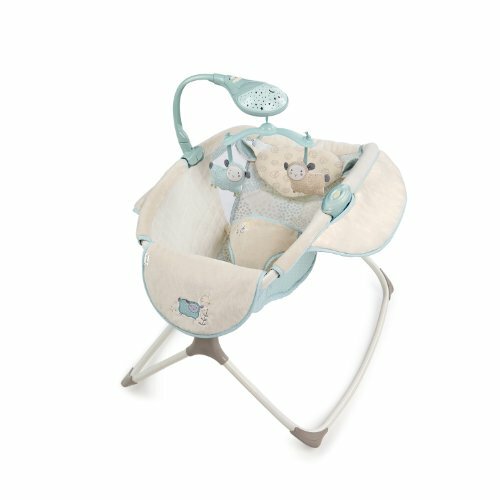 Another capability that this little rocker offers is the ability to vibrate which provides another way to calm your baby. The included mobile comes with 2 soft toys to look at and offers parents the choice of 8 melodies and 3 nature sounds to choose from to add to the entertainment factor of this comfortable and soothing baby rocker. The frame of this rocker is lightweight and easy to store or travel with. When your baby is small, the lamb shaped headrest gives soft, cushioned support. The mesh sides allow the air to circulate so your baby doesn’t get overheated. Babies and toddlers alike will love the soft, starry night show that gets projected onto the ceiling. The headrest is easy to keep clean and can be taken off and it is machine washable. The two lamb toys go along with the lamb theme and will work for boys and girls. You will need 3 AA batteries for the starry night projector and 1 C battery for the vibration unit. These batteries are not included. 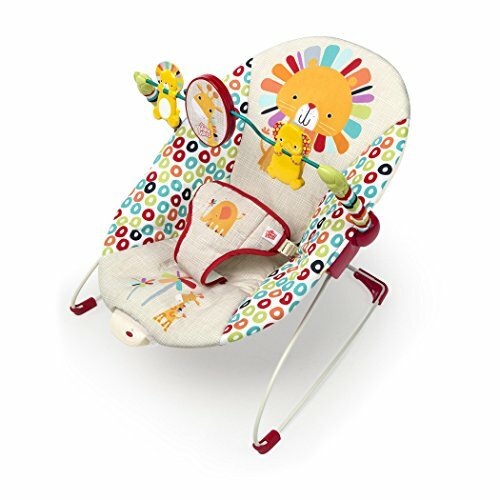 The Bright Starts works as a baby rocker and can also be adjusted to double as a stationary lounger that vibrates. The gentle front and back rocking motion can be very calming and soothing to a little one. You also have the option of flipping down the Rock Locks and turning the baby rocker into a stationary seat. Turn it on and the vibrations start, working to calm a fussy baby. The 3 point harness keeps your baby safely in the seat. The vibration mode has two speeds that can be chosen to keep your baby relaxed and feeling calm. The multi-position reclining seat offers a few different positions that you can place your baby in depending on what their mood is. This multi-positioning seat is great for babies that have reflux and can help them sit up more which is more comfortable for them. Storage and travel is super simple with the compact way the baby rocker folds up. This means moving it from your house to grandma’s house or taking it on vacation is simple and convenient. Thanks to the super slim fold up capability, this item can easily slide under the bed, or couch or slip behind it. It comes with an entertaining toy bar that keeps the baby entertained. This seat works for babies from 5 ½” to 30 pounds. The gorgeous intricate tone on tone lattice pattern is a soft dove gray which provides so much elegance and has accents if ocean blue and three additional shades of gray for a fashionable look that works for boys or girls. When it comes to soothing a fussy baby, parents have used everything from sitting a seat on top of the clothes dryer to driving their fussy little ones around in the car to get them to fall asleep. It can feel pretty frustrating sometimes when nothing seems to be working. Another alternative to driving around your neighborhood all evening is to use a baby rocker. Babies love rocking motions and find them very soothing. 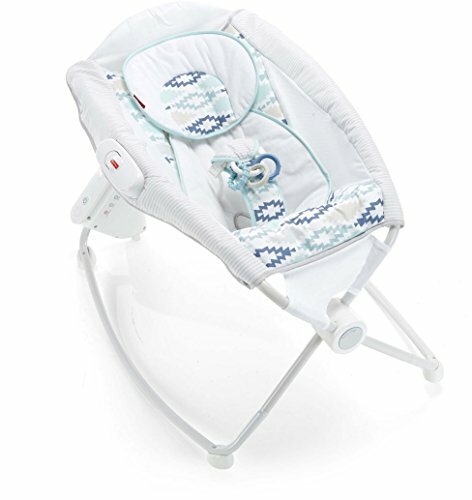 Putting your fussy baby in a rocker that has comfortable reclining positions, soft vibrations, and a soothing front and back rocking motion will distract them and calm them so they are not fussy anymore. The top rated baby rockers that we reviewed here are all perfect for a young newborn and will work up to 30-40 pounds which is typically toddler age. Read our buyer’s guide to learn more about choosing the perfect baby rocker for your little one. A baby rocker is a popular baby item that provides a place to put the baby that can be very calming and soothing. It is a little chair that in most cases can either rock or be locked into place as a stationary baby seat and later and regular toddler chair. Most baby rockers offer toys to look at and play with, music to listen to and vibrations that assist in helping a colicky, fussy or restless baby. Baby rockers come in many different styles and designs with different features available depending on the model. There are many benefits to having a good quality baby rocker for your baby. Unfortunately, even with the creation of baby slings and wraps, there are times when a parent just can’t hold the baby and needs both their hands. A baby rocker is the perfect solution to these times. It will provide a soft, safe and soothing place for your baby to rest while you are taking care of other things. So what kinds of benefits will your baby rocker provide? There are several and all of them equal a happy and calm baby. We have outlined the benefits that a parent can expect when they purchase a baby rocker. A safe place to rest – The best place for your baby to sleep is in their crib or bassinet but if you are looking for a place to put them that they will be safe while they are awake, a baby rocker is perfect. Remember not to have your baby in the baby rocker or any other similar piece of equipment unattended. A baby rocker can be moved around the house easily and provide parents with hands free time if they need it. Vibrations are great for fussy babies – Motion has been a long standing way of calming a fussy baby and soothing them to sleep. May baby rockers offer the capability to press a button and the baby rocker will vibrate gently. This battery operated vibration provides continuous motion so the parents don’t have to keep moving the rocker themselves. Stimulating Toys to Entertain the Baby – The majority of baby rockers have removable toy hangers that provide the baby with overhead toys to look at and reach for. The toys are usually plush toys that the baby can grab safely and not hurt themselves. Once the baby gets too old to have the toys overhead, the y can be removed and handed to the baby separately. Once you have made the decision to purchase a baby rocker, there are several features to consider. Not all baby rockers have the same features, so deciding which ones are important to you is something that you need to decide early on in the process. We have listed the common features that baby rockers can have. Size – Not all baby rockers are the same size. If space is an issue, you will want to look for a baby rocker that is either smaller than other models or that has the ability to fold up and be stored easily when not in use. Look at the dimensions of the baby rockers you are considering to see what size they are, especially if space is a premium in your home. Color and Design – Baby rockers come in a variety of colors and designs. Some are more elegant in design and work for that type of décor and others are more whimsical, with bright, bold colors and patterns. If design and color is important to you, rest assured that there are plenty of options for you to look at. Light Projectors – Not all baby rockers have this feature but the ones that do are very cool indeed. The projector system works by projecting stars or other designs onto the ceiling or walls when turned on. It provides an additional method of keeping the baby entertained when the parents can’t hold them right away. Vibrations – Many baby rockers offer vibrating technology that aide in calming a fussy baby. Many will have two or more speed options so you can decide on how much or how little vibration the rocker provides. Music and Sounds – Another feature that baby rockers can have is music. Babies love music and sounds. Many baby rockers offer different modes of music that parents can choose from. Whether it’s classical music or nature sounds, your baby will enjoy the tunes that the baby rocker will provide. Restraint system – Keeping your baby safe is a top priority that all parents have. A good quality restraint system will ensure that your baby does not fall out of the baby rocker. Look for a restraint system that has a strap that comes up between the legs to prevent the baby from scooting underneath the belts or straps. Locking legs – A feature that some models have is a fold out locking leg that turns the baby rocker into a stationary seat. This is convenient if you want to feed the baby in their rocker and need the seat to be still. It’s also better when the baby is old enough to play with the toys so they are not rocking away from them. Reclining Seat – Many baby rockers have reclining seats that have multi-positional capability. This is great for when you want the baby to sleep or you want to have them in a more upright position for playing or being fed. Most baby rockers will have 2 or 3 different seat positions that can be chosen. Keeping your baby safe is important every single day. There are some things you need to remember when it comes to keeping your baby safe while they are in their baby rocker. Always put the baby rocker on the floor – Even though they are small and the temptation might be great, you should never put the baby rocker on a table, counter or couch. They could easily tip the rocker on an unsteady surface and the results could be disastrous. Pay attention to what is around the baby rocker – Even with the baby rocker on the floor, parents need to be mindful of where the rocker is in relation to lamps, TVs, and other things that they could grab onto and pull over onto themselves. Put the rocker in the center of the floor away from things that can hurt them. Don’t leave the baby in the rocker too long – If the baby is always in the rocker, it will lose the effectiveness it has in calming them down. No one wants to be in the same position for hours on end. The purpose of the rocker is to calm a fussy baby or entertain a restless one. Leaving them in it all the time will cause them to hate being in the very thing that is supposed to help soothe and calm them. A good time frame is 20-30 minutes tops at one time. Don’t wait until they are fussing to get out of it before you take them out. There are many different types of baby gear on the market today. As a parent, especially a new parent, trying to decide between all of the different baby items can be daunting enough. What is a necessity? What is a luxury? While a baby rocker isn’t necessarily a necessity, it does a lot to make a parent’s life easier. Baby rockers are smaller baby items that pack a big punch when it comes to providing assistance to parents who may need to take care of a few things and have the use of both their hands. While the baby should NEVER be left in the baby rocker unattended, it is small enough that the parent can move it around the house and put the baby in it while they are tending to other responsibilities. It is a safe place for the baby to hang out and be entertained and soothed while being under the supervision of the parent still.